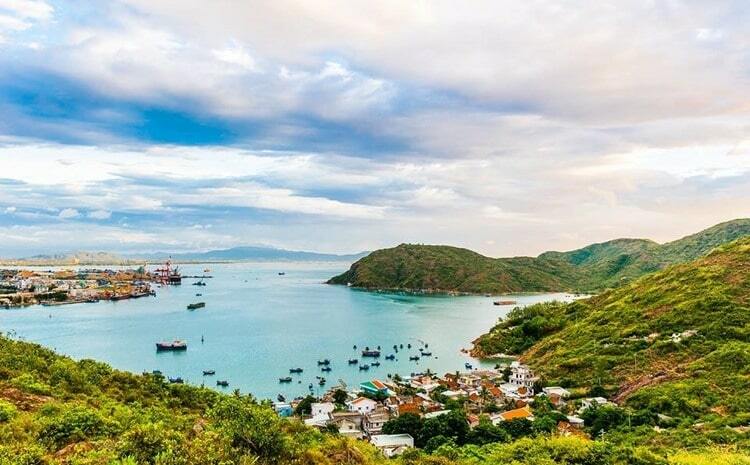 Visiting Quy Nhon (Quy Nhơn) city, tourists and visitors don’t want to miss the chance to explore the beauty and discover attractions on the Phuong Mai Peninsula (Phương Mai) in Quy Nhon which is gifted with a diversity of the ecosystem, species of animals and plants, and breathtaking landscapes. Coming to the Phuong Mai Peninsula that is located 8km northeast from Quy Nhon city, tourists can enjoy the picturesque natural scenes on Thi Nai Bridge (Cầu Thị Nại), join in interesting games on Phuong Mai sand dunes, watch beautiful coral reefs, swim in the charming beaches and eat delicious seafood or specialties of Quy Nhon. The best time to visit the Phuong Mai Peninsula is from February to August because during these times, there is a lot of sunshine and you will have opportunities to take beautiful pictures and take part in many outdoor activities without facing rain or storms. Phuong Mai sand dune is situated near the Nhon Ly (Nhơn Lý) beach, Phuong Mai Peninsula. With the height of about 100m, Phuong Mai sand dune is an ideal place for tourists to see the vastness of the earth and the panoramic view of the peninsula. The beautiful brown and white hills give this peninsula a wonderful wild beauty. If you want to experience the feeling of being lost in a wild desert with white sand dunes and large valleys, Phuong Mai sand dunes will entirely give you that feeling. Sand skiing is an outdoor activity tourist should not miss when visiting Phuong Mai sand dune. Using wood boards to slide at high speed is a great experience. Phuong Mai Peninsula crosses the sea through 5 short bridges and Thi Nai Bridge that have a total length of 7km. 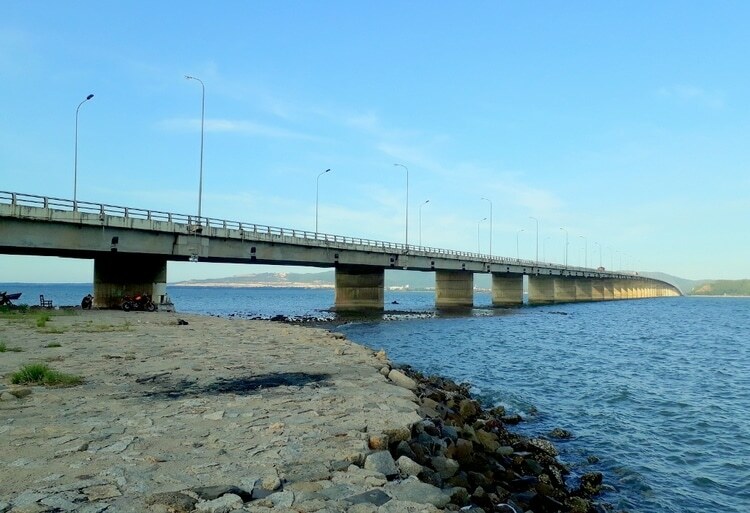 Thi Nai Bridge is the longest bridge with 54 spans and 2,477,7 m long connecting Nhon Hoi (Nhơn Hội) economic zone and Quy Nhon city. Thi Nai Bridge has become a pride of local people and attracted a large number of tourists traveling to Quy Nhon. If you visit Phuong Mai Peninsula, you should see the natural landscapes along both sides of Thi Nai Bridge. Exploring the Ky Co (Kỳ Co) Beach that is owned privately on the Phuong Mai Peninsula needs you to pay money with the cost of 60,000VND per person. On the Phuong Mai Peninsula, you can walk along the beach, swim in clean water and get into the boats. The majority of the Phuong Mai Peninsula doesn’t develop tourism, so what attracts numerous tourists and travelers coming here is its local experience. When you cross the Thi Nai Bridge, you will be astonished at the long large empty roads with almost no traffic or people. In the local towns of the peninsula, you hardly find other foreigners, which makes this peninsula full of local atmosphere. Everything here is cheap and affordable. A glass of Quy Nhon beer costs you only 6000 VND while in Quy Nhon city, you have to pay at least 20,000VND. Hon Kho (Hòn Khô) island catches the curiosity and interest of tourists thanks to the clean water, white sand beaches, green grass, and beautiful coral reefs. If you want to spend one day visiting Phuong Mai Peninsula, it is impossible to miss Hon Kho Island. 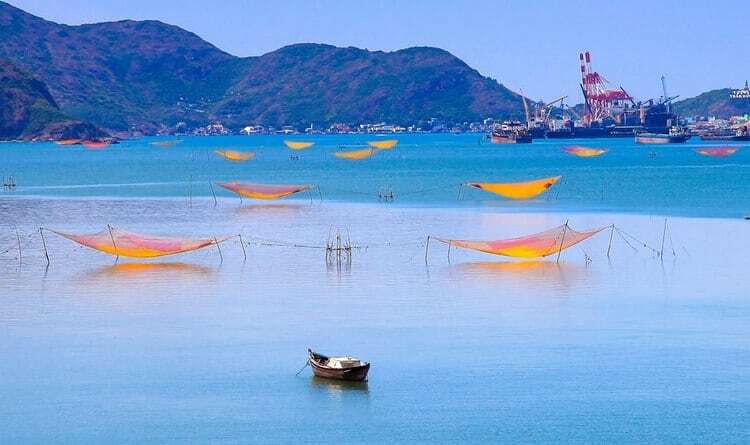 If you are a fan of beautiful beaches, Nhon Ly Beach located in Phuong Mai Peninsula is an ideal place that is receiving a lot of tourists and travelers every year. Nhon Ly Beach is well-known for the impressive natural scenes, pine forests, infinitive sea, and sand dunes. Phuong Mai Peninsula has several must-visit fishing villages lining the coast where tourists can see many big crab cages, blue boats, divers and fishermen. Coming here, you can meet the friendly and open local men and go fishing. In Phuong Mai Peninsula’s local fishing villages, you can enjoy the seafood that is caught daily with the cheap cost. There is a little restaurant in the fishing village near Nhon Hai (Nhơn Hải) beach. The waiters and waitresses don’t speak English but are very open and friendly. The special dish on the menu is fresh oysters mixed with a mustard sauce that costs you only 100,000VND or $4.30 USD. In this restaurant, they also serve many delicious specialties of Quy Nhon and Binh Dinh province. It is quite difficult to find a hotel on Phuong Mai Peninsula. Therefore, you can ask the locals for you to stay overnight.